David Bowie, The Man Who Fell To Earth, British Lion Film Corporation, 1976. As I was walking my dog this morning, I wondered what an alien species would think about us if they ever came to visit. Don’t blame me; I hadn’t had any coffee yet. I came up with a list of things that aliens would probably find really strange about the human species and here it is. Ta da! In this post, I’ll be acting as alien ambassador. The odds that aliens would visit us and that I, your friendly neighborhood goldfish, would act as an intermediary are about as small as my winning an Olympic gold medal, but this is my blog, so I can do what I want. Alien Visitor: Wait, so half the year, you use one time, and the other half of the year, you use another time? Alien: You’re saving time for what purpose? Me: Well, we’re not saving it per se, not like putting money in a bank, but aligning our time so that we use the least electricity. Alien: But not every one participates? Me: That’s correct. Even in this country, The United States, there are a few states that don’t participate. Alien: Doesn’t that make it awfully confusing? Me: Yes. Yes, it does. Alien: Well, why do it then? Me: I have absolutely no friggin’ clue. Alien: I see a lot of your people walking four-legged creatures around on ropes. What’s that about? Me: Those are dogs. They are our pets. Me: A pet is an animal that we look after. They are our companions. Alien: They’re different species than you? Me: Yes, we have dogs, cats, reptiles, fish, birds and all sorts of other creatures as pets. Alien: You don’t keep humans? Me: No, not anymore. That’s called slavery and that’s bad. Alien: So, non-humans then. Do they have a choice in the matter? Me: Well, sometimes, yes and sometimes, no. Me: Oh, no, not at all. We take care of them. A lot of them couldn’t survive on their own. Alien: Why is that? They were originally wild creatures, no? Me: We’ve domesticated them and now they depend on us. Alien: So, you bred out the wild qualities and made them depend on you and now you keep them in your homes sometimes unwillingly? Alien: And this zoo thing? Me: Those are wild animals that we keep so that people can visit them and learn what they are like. Me: No, they’re not. They’re technically still wild animals. Alien: Wild animals that you keep in cages for people to look at. Alien: So, most of you work away from your homes? Alien: Why do you live far away from your homes? Me: Lots of reasons. Sometimes, we can’t afford to live where we work. Sometimes, spouses work somewhere else so we live in the middle between them. Some people want their kids to go to a certain school. Some people just enjoy living in a certain neighborhood. Alien: Well, why don’t they get a job in that neighborhood then? Me: They’re not always available. Alien: But there are jobs in that neighborhood that someone has? Why not just take those and make the people who live far away work in their own neighborhoods? Me: I’m not sure. It’s not that simple I guess. I suppose it goes to free will. We don’t like being told what to do. Alien: And you commute to these jobs in other neighborhoods in these little metal boxes? Me: Yes, they’re called cars. Alien: And they run on a limited supply of fossil fuel that is hard to get and pollutes the air. Why don’t you use some other cleaner form of transportation? You have trains. Why not use those? Me: A lot of people do, but humans love their cars. We have cleaner forms of transportation, but as of now, they’re expensive and not everyone can afford them. Alien: Why not just force people to switch? Me: It’s not that simple I guess. Politics and we don’t like being told what to do. Alien: I’ve noticed a lot of grey and black on your surface. Me: Oh, you mean concrete and asphalt. Me: Well, mostly for cars to drive and park on. Some of it is for pedestrians though. They’re called sidewalks. Alien: So, people do use their legs to move about sometimes instead of cars? Me: Oh, yes, of course they do. Alien: Why don’t they do that all the time then instead of using cars? Me: Cars move a lot faster than we can walk. Alien: Then why do I see them stopped so often? Me: That’s called traffic. It happens when a lot of people are trying to get somewhere all at the same time. We have what we call rush hour when most people are trying to get to work at the same time. Alien: Why don’t you stagger your work hours to avoid traffic? Me: We do, sometimes, but generally, it’s best where business is concerned that we’re all working at roughly the same time so we can communicate, buy, sell, trade and whatnot. Alien: So, in order to run these polluting cars around to jobs that are far away, you have cut down trees and made roads of concrete that run through neighborhoods that you all drive on all at the same time slowing everyone down. Alien: Who’s in charge of your planet? Me: Lots of people are. We have a lot of different countries and each one has its own government. Alien: Oh. Well, who’s in charge of them? Me: No one. Each country governs itself. Alien: There’s no one overseeing the whole planet? Me: Well, no. We do have The United Nations where different countries are represented and make decisions. Alien: So, they’re in charge then? Me: Well, no, not really. Each UN representative is beholden to the government of their country. Alien: And each country is in this United Nations? Me: No. There are 193 United Nations member states. The number of countries on earth is always changing, but it’s higher than that. Alien: So, not everyone is represented in this United Nations? That doesn’t seem fair. Alien: And who decides that a country is a country and who decides who is allowed in to the United Nations? Me: The UN general assembly votes on new members. Countries are created through wars and coups and revolutions. Me It’s a conflict between people and countries. Me: Wars happen for a lot of reasons: disagreement with the current government, country boundaries, religion, racism, greed, oil, money, etc. Alien: Those all sound like bad reasons to kill each other. Me: They are bad reasons to kill each other. War is always stupid and bad and unnecessary. Alien: Then why do you do it? Me: Because there’s always someone who wants something someone else has or wants a certain race out of their country. Wars are sad. Alien: Then you should stop doing that. Alien: Humans come in a lot of different shapes and colors, but you’re all the same species? Me: Yes. Humans come in many different shapes and sizes and colors, but we’re all human. We all share the same basic structure. Alien: It seems that some of you don’t agree with that. Me: That’s true. There are some people who think they’re somehow better than others because of their color or shape, but those are the minority. Alien: But you have wars and kill each other over race. Me: Yes, sadly, we do. Alien: Why? It is common knowledge that you’re all the same species? Me: Yes, it’s common knowledge. Alien: They who do some people think they are better than others? Me: Because they are wrong. Alien: Then they should stop thinking that. Me: Yes. Yes, they should. Posted in fiction, NaBloPoMo and tagged alien, BlogHer, conversation, fiction, NaBloPoMo, NanoPoblano, YeahWrite. Bookmark the permalink. Great post. I wonder what they think of us. I’m sure they find us very bizarre. Who know how they think of us? Sometimes, I hope they never visit so we don’t have to explain ourselves. The human race, when looked at simplistically like this, is quite moronic. Loved it. What a polite alien. Hopefully they will give us time to grow up before demolishing us to make way for an intergalactic freeway. Here’s hoping since I don’t even have an electronic thumb. I do have a towel though. Good stuff, Goldie…keep at it! Almost there! Ha, no, you’re not, but you can do this! I’m as confused about Daylight Savings Time as the alien. Reminds me of the Nacirema lesson in school. 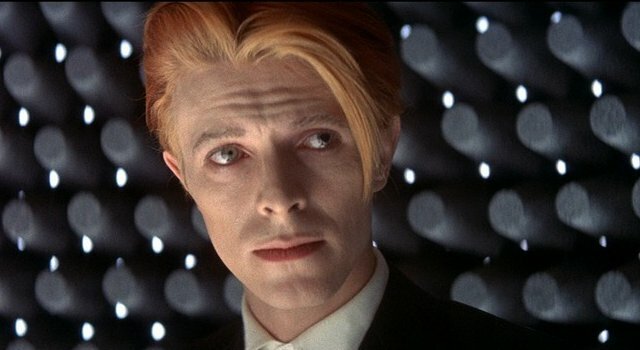 I hope the aliens DO look like David Bowie. Oh I love this! I was trying to explain daylight savings to someone the other day and it made about as much sense. I have often thought “how would I explain THAT behaviour to an alien! I had two international students board with me last winter, one from Hong Kong and one from Indonesia. Just explaining some things to a fellow earthling from another culture was baffling enough! In sci fi movies and the like, they usually have aliens of a species basically look and act alike, but think of how diverse just the species of Homo sapiens is on just this one planet. Think of how many different languages, cultures, religions and appearances there are. it’s amazing. Put like this, it’s actually all quite strange, haha! 🙂 Loved this. What if the alien comes from a planet that’s worse than ours? Maybe they’ll wonder why we don’t do even more messed up things….. Although, since it’s your post, we’ll have to go with your way of thinking. Great observations on the absurdities of earth. And I would so buy a tesla car if they were afforble and all wheel drive. I would buy a Tesla too. They’re not hard on the eyes like a Prius. Perhaps you will be the next Vonnegut? Really? That’s a nice compliment. Thanks. Great post. Our way of life makes no sense when you stop to think about it, but we hardly ever do. Thanks. It is strange the things we just take for granted. Love It ! Great read ! YES. Is there a love button? I need a love button. Hands down, this is gold writing on WordPress.